Wonder Woman has finally hit the big screen! After decades in comic books, television, animated movies, the Super Friends, Justice League and Justice League Unlimited and many others i’m probably forgetting, Wonder Woman has finally landed her own feature film. And it was a really good movie. A few things I appreciated about the film right off the bat (see what I did there?) were the direction, cinematography and action choreography. Patty Jenkins should be applauded for taking this character, the mythos and location hopping and not turning it into one big commercial for the upcoming Justice Leauge movie. You definitely get your tie-ins to the larger DC universe, as shown in the first three scenes of the movie when a Wayne Enterprises armored truck pulls up to the Louvre museum in Paris and a note from Bruce Wayne, but that is it for the rest of the movie. 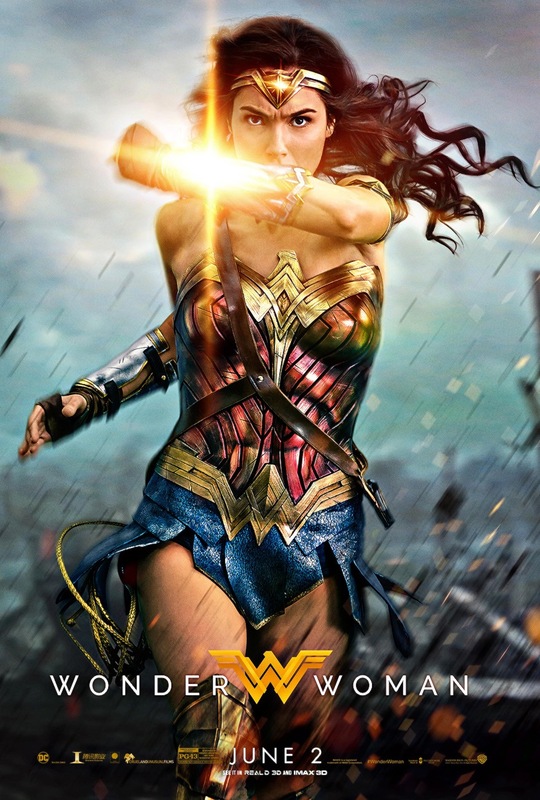 The movie is told as one complete tale that solely focuses on Wonder Woman and her journey from the relative safety of Themyscira, through the trenches of what I am assuming was the Somme and to the final climactic battle with the head of the German war machine in the grim and grey of World War I. She has a fully fleshed out character arc and I totally appreciate the care that went into crafting this tale. Gal Gadot lights up the screen every time she appears and for all intents and purposes IS Wonder Woman. She is unfairly beautiful, emotive, charismatic, charming and you can tell she fully prepared physically for this role. She’s the best thing about the movie (as she should be) and I would argue that she was the best thing about Batman V Superman as well. Chris Pine is Captain Kir– um, Steve Trevor, the dashing spy that crash lands in Themyscira and is the catalyst for Wonder Woman to leave her home and protect the world from the threat of war. Pine is great as usual, with his familiar Kirk swag, but he never outshines Gadot. A delicate balance struck by Patty Jenkins, to which more kudos should be given. I don’t want to go into too much more detail about the movie for fear of spoiling some of the more exciting moments of the movie. Suffice to say, this is a film that should be experienced inside the theater. Patty Jenkins just dropped the last Wonder Woman trailer on Twitter! Looks amazing! What do you think? Wonder Woman “Rise of the Warrior” 🛡⚔️ final trailer is GLORIOUS! Last night Warner Brothers and Wonder Woman director Patty Jenkins, dropped a pair of trailers for the upcoming Wonder Woman movie! It looks awesome! Wonder Woman is an upcoming American superhero film based on the DC Comics character of the same name, distributed by Warner Bros. Pictures. It is intended to be the fourth installment in the DC Extended Universe. The film is directed by Patty Jenkins, with a screenplay by Allan Heinberg and Geoff Johns, from a story by Heinberg & Zack Snyder and Jason Fuchs, and stars Gal Gadot, Chris Pine, Connie Nielsen, Robin Wright, Danny Huston, Elena Anaya, Lucy Davis, Saïd Taghmaoui, Ewen Bremner, and David Thewlis. In Wonder Woman, after American pilot Steve Trevor crashes on the island of Themyscira and tells Diana Prince about World War I, Diana leaves her home to try to stop the war and becomes Wonder Woman. Principal photography began in late November 2015 and wrapped in May 2016. Wonder Woman is scheduled to be released on June 2, 2017, in 2D, 3D, and IMAX 3D.